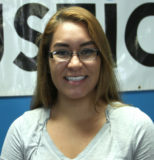 Alissiea Hernandez is a native New Mexican born in Las Cruces, New Mexico. Alissiea was involved with her high school media program, Centennial Student News (CSN) where she spent 4 years gaining hands-on experience in broadcast journalism. Alissiea took every opportunity to learn more about broadcasting: she reported live from the sidelines at football games with Las Cruces Public Schools Television (LCPSTV), and also had an internship with her hometown radio station. Alissiea’s involvement with media turned into a passion, and she decided to pursue a career in broadcast journalism. Alissiea is a junior at the University Of New Mexico, majoring in Journalism and Mass Communication with a minor in English Literature. Alissiea intends on being a television reporter in New Mexico and hopes to change the way media reflects negativity in the news world.